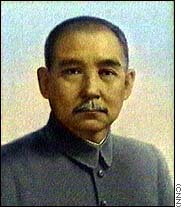 Sun Yat-sen is often called the father of modern China, and his legacy is claimed by the governments of both China and Taiwan. "... the people constitute the foundation of a nation and they are all equal in their own country." (CNN) -- Charismatic and single-minded to the point of obsession, Sun Yat-sen played a key role in bringing down the Qing (Ch'ing) Dynasty but did not live long enough to see the revolution run its course. Often called the father of modern China, Sun occupies a unique historical position. 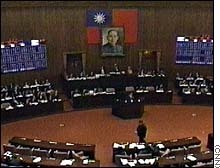 Ideologically opposed, the governments of China and Taiwan both claim the legacy of his revolutionary ideas. Sun was born into a family of poor farmers in the southern Chinese province of Guangdong. One of his first experiences with the outside world came through his brother Mei, a laborer in Hawaii, who brought him to the islands to study at a British missionary school. It was there that Sun converted to Christianity (to the consternation of his brother) and was baptized in 1884 or 1885. Sun later returned to Hong Kong, where he enrolled in medical school and married a girl chosen for him by his parents. Their union eventually produced three children. He graduated in 1892 and set up a medical practice in Canton. The traditional lifestyle didn't hold his interest for long. By 1894 he had abandoned medicine for politics. Some years later he scandalized many of his followers by marrying his secretary, Soong Ch'ing-ling, who was 27 years his junior, without divorcing his first wife. Madame Sun's younger sister later would marry Sun's eventual Kuomintang successor, Chiang Kai-shek. Like many activists, Sun was troubled by the Qing court's resistance to reform and its lack of resistance to the Western powers. In 1895 he helped plot an uprising in Canton. When the scheme failed, he embarked on what would become a 16-year exile abroad. He went to London, then to Japan, where he spent time courting potential backers. 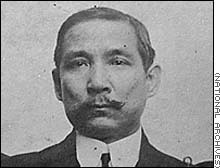 In 1905 he emerged as head of a revolutionary coalition, the United League, based in Tokyo. The group was loosely organized and unwieldy, but Sun used its mouthpiece, "The People's Journal," to disseminate propaganda. His ideas gained credence with many overseas Chinese students. Sun's philosophy, honed over many decades, boiled down to "Three Principles of the People": nationalism, democracy and people's livelihood. "Nationalism" involved the overthrow of the emperor and the ending of international hegemony over China; "democracy" meant a republican, elected form of government; "people's livelihood" called for extensive land reform. "There is no ground for preserving a monarchical form of government," Sun wrote in his Fundamentals of National Reconstruction, "since it is widely recognized that the people constitute the foundation of a nation and they are all equal in their own country." After a fund-raising tour through Europe and the United States in 1910, Sun made one more attempt to spark a rebellion in Canton, but it fared no better than his earlier plots. The Revolution of 1911, however, gave Sun a golden opportunity. As the spontaneous uprising spread rapidly from Wuhan through the rest of the country, he returned to China and was elected provisional president of a self-proclaimed republic in 1912. Perhaps hoping to head off a civil war, Sun made a strategic alliance with Yuan Shikai, commander-in-chief of the imperial army, who had seized power from the child emperor Pu Yi in Beijing. Yuan was made president, while Sun became a minister in the government. The entente did not last long. Just a few years into the alliance, Sun accused Yuan of having one of his associates murdered, and set up a rival government in southern China. In the ensuing years, Sun strove to unify his Kuomintang party, which was beset by internal rivalries. During this period, Sun was constantly frustrated in obtaining Western support. Western officials still recognized Yuan and successive warlords in Beijing as the Chinese government. They considered Sun something of a crackpot and a schemer with a history of failed uprisings. It was one of the biggest ironies of Sun's life that he spent so much time abroad and developed such a extensive knowledge of Japan and the West, but failed to secure their support when he most needed it. Sun soon began turning to Moscow for assistance. Soviet advisers arrived in 1923 to help reorganize the Kuomintang. By 1924 Sun had reshaped his party into a disciplined organization modeled after the Communist Party of the Soviet Union, with authority descending from the top. 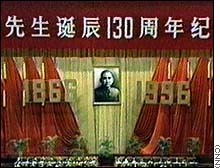 Sun also brought members of the much smaller Chinese Communist Party into the leadership structure, and established a joint military academy with the CCP to train soldiers and propagandists. Even as he strengthened his Nationalist movement, however, Sun himself was growing weaker. He succumbed to cancer in 1925, passing the mantle to one of his deputies, Chiang Kai-shek. After struggling tirelessly for revolution, Sun was not there to witness the Kuomintang's victory over the warlords in Beijing, nor his party's eventual and fateful split with the Communists.